Upon the common, called Midgham foot, a little beyond the favourite premises of Burdoswald, the Wall had been recently taken down, and lies in heaps, as if the country could not produce one soul to protect Antiquity. Agricola and Hadrian lie one hundred yards on my left. I thought I observed the foundations of a turret, but am not certain; I saw, however, forty yards of facing-stones, from five to seven courses high. In another place on the common called the Banks, I saw eight. All the mounds, the Wall, and the ditches, are seen all the way along this common; the Wall four feet high. At Bank head, the foundation of the Wall only is seen; the trench is in perfection; a foot-path runs along the bottom. I entered a farm-house for intelligence; I was treated with great shyness, till they understood my pursuit. It appeared, they had taken me for a purveyor of land, preparatory to inclosing the commons. At Hare hill, which, by the bye, stands in a valley, the Wall is ten feet high, and five yards long; but the front stones are gone. I viewed this relick with admiration; I saw no part higher; it was within two feet of the battlements. Near this place the Wall is five feet high, with the foundation of a Castle twenty yards square. Now I find a small part, with three tier of facing-stones, ten yards long, and four feet high, with a new wall added by a gentleman to the old, which will preserve it. A little farther, the banks and ditch are perfect; and Severus’s Wall is built upon the soil thrown out of his own ditch, as is perceptible in many other places. Over the valley, for the space of two hundred yards, the Wall is four feet high, and a boundary hedge grows upon its top. Proceeding from Haden, a new Wall is erected upon the spot where the old one stood, with some of its materials; and the remainder are scattered. I now traverse another common, half a mile over, where all the works are just discernible. Then passing half a mile more, part over watery ground, and the sun down, my limbs told me, I had done enough for the day, and a guide directing me where I might sleep, I applied to the sign of the Cow and Boot, at High Walton, for a bed. Silence was the answer which I considered a favourable one. There were, besides the father and mother, six children, chiefly females, and grown up. One of them, a young woman, I was sorry to see, was approaching the grave. Although a publlc-house, they had no ale, cyder, porter, beer, or liquors, of any kind, or food, except milk, which was excellent; but they treated me with something preferable, Civility. When I rose the next morning, and asked my worthy landlady, what I had to pay? I found she would be satisfied with only a few pence! Ignorant of the polite art of duping, I found she knew but little of the world. I laid down two shillings. In surprize, she returned one, and offered to give change for the other. I insisted upon her taking both. Still unwilling, I was obliged to promise to make her a harder bargain at my return. When a man serves me with his best in time of need, he merits my money and my thanks. Fifty miles from Newcastle, and eight from Carlisle; a modern name, derived from the river Cambeck. The works are wholly gone; for a gentleman, who, like other “wise men from the East,” had acquired a fortune in India, recently purchased the estate on which this Castle stood, for thirteen thousand pounds, stocked up the foundation, and erected a noble house on the spot. Other Stations preserve the ruins, but this only the name; and is the first which has been sacrificed to modern taste. It also bears the name of Castle Steads, perhaps the most proper. This small fort stands at so great a distance from all the works, that I can scarcely admit it among the Stations. It could be of no more use to Severus’s Wall, than various other fortifications scattered over the country on both sides of the Wall. It might be of rather more use to Agricola. 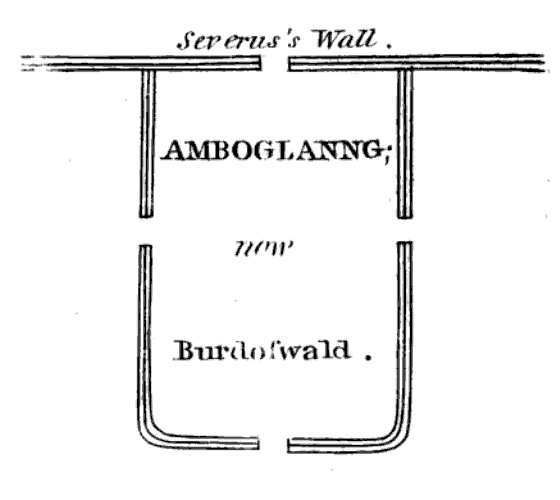 It is the third reputed Station which stands out of the line; and was, I have no doubt, erected by him, and most probably accepted by Severs, and occupied by him as a Station; otherwise, we cannot account for the great vacancy between Burdoswald and Watch Cross, which is more than nine miles; or rather between Burdoswald and Stanwix, which is fourteen miles, and would have been too great a distance between the Stations, a distance no where found. So that between the above two, which line with the Wall, we find two that do not, Cambeck Fort, of which we now treat, and Watch Cross, which follows. The ground plot was visible before the purchase, and is all that was left of the Station. Along the Wall, Severus’s ditch with the Works of Agricola and Hadrian may be traced; but the higher we rise in cultivation the more we sink in antiquity. The plough will bury its last remains. Most of the inscriptions in this section are centurial building stones but it includes four key building inscriptions from Milecastles 37, 38, and 42. 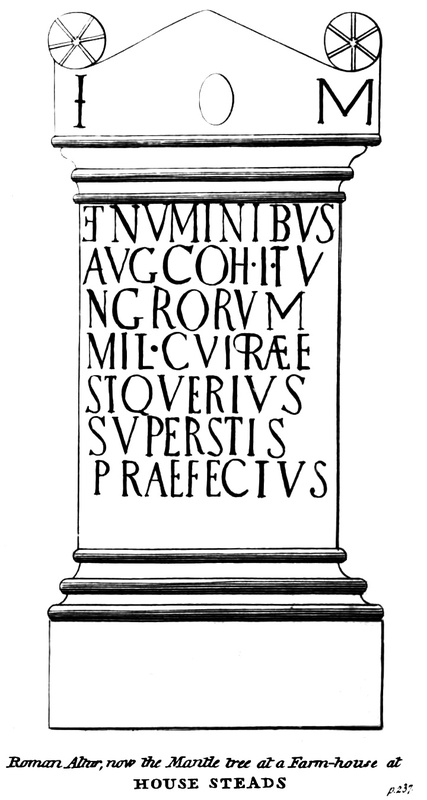 Four iconic inscriptions confirm the construction of Milecastles 37 (1634), 38 (1636–7), and 42 (1666) under Hadrian, mentioning the governor Aulus Platorius Nepos by name. The last two in particular were instrumental in untangling the old notion that the stone wall was built by Severus and the Vallum by Hadrian. However, the presence of a further building inscription of the Sixth Legion at Milecastle 37 (1635), suggests reconstruction work by the Sixth at some point (perhaps under Severus?). This may also have been the occasion when civilian levies were employed on building work (1672–3 and 3376). Milecastle 37 also produced an altar to Cocidius (1633), presumably indicating that one of the pastimes of the garrison was hunting and Milecastle 42 part of a tombstone (1667). The bulk of the rest of the inscriptions are centurial stones, their number probably reflecting the work undertaken by Clayton’s men in excavating and reconstructing the curtain wall in this section, along with subsequent modern repair and consolidation, by comparison with other areas to the east and west. This small station, thirty-eight miles from Newcastle, seems to belong rather to the works of Agricola, than to those of Severus; or perhaps it belongs to neither, being about three hundred yards South of the nearest. The situation of the ground is a valley between two hills. Through this valley, and through the Wall, runs the river Tippal, which opening demanded a security to the pass, as well against the Britons as the Scots. Opposite therefore to Carvoran was erected in after-ages, on the North side of Severus’s Wall, Thirlwell Castle (*Thorough Wall*) from the Scots breaking through. The situation of Thirlwell Castle is well chosen, upon an elevated round knob of earth. It is the property of the Earl of Carlisle, and far gone in decay. Here I met with all the civility, even friends could bestow. A little beyond is the mark of a Mile castle, ten yards square. I have now done with desolate mountains, precipices, and climbing stone walls; which have continued more than ten miles. Half a mile short of Mumps Hall is a hollow in the mountain called *Stone Gap*, where the Scots broke through. I am now in that part of the Wall which Nature had the least defended; for the river Tippal, mentioned above, falls into the North Tyne. This last running forty miles Eastward, and parallel with the Wall, on the South side, became a kind of guard which prevented the northern plunderers from penetrating into the country. And, about three miles West of this place, the little surly river Irthing crosses the Wall, and flows into the Eden; which running Westward to Carlisle about eighteen miles, became an out-guard to the other part of the Wall. The* intermediate space of three miles between the North Tyne, aided by the Tippal on the left, and the Irthing feeding the Eden on the right, became a fine opening for plunder. I now cross a small rivulet called Poltross which gives me an entrance into Oumberland, being forty-four miles from the Wall’s end, forty and a half from Newcastle, about sixteen and a half from Carlisle, and twenty-nine and a half from Boulniess. The Wall, close to my left, runs along a meadow, is about a yard high, in confusion, has a hedge growing upon it, till it reaches the East bank of the Irthing, where it stops. The West bank is a precipice, which Warburton calls forty yards perpendicular: perhaps he is right. The Wall undoubtedly went to the foot of this hill, and must end there; for the side is too steep, I think, to admit a Wall; but its broken end is visible on the top. I had this river to cross, and this mountain to ascend; but did not know how to perform either. I effected a passage over the river by the assistance of stones as large as myself, sometimes in, and sometimes out; but with difficulty reached the summit of the precipice by a zig-zag line, through the brambles, with a few scratches. At the top I had a view of the Wall where it was broken off to the foundation. It measured seven feet exactly. Tradition says it derived its name from Oswald, King of Northumberland, who was surprized by his enemies while fishing in a neighbouring pool. It could not be Oswald, who lost his life in battle with Penda, the Mercian King, at Oswestry. If there is any truth in the tradition, it must have been Oswald, who was raised to the throne of Northumberland by a faction, about the year 800, and was deposed after a reign of twenty-eight days. When I entered the house of Mr. Bowman, who is the proprietor, and occupier, of these once imperial premises, I was received with that coldness which indicates an unwelcome guest, bordering upon a dismission; for an ink-bottle and book are suspicious emblems. But, as information was the grand point in view, I could not, for trifles, give up my design; an expert angler will play with his fish till he can catch him. With patience, with my small stock of rhetoric, and, above all, the simplicity of my pursuit, which was a powerful argument, we became exceedingly friendly; so that the family were not only unwilling to let me go, but obliged me to promise a visit on my return. They gave me their best; they wished it better. I had been, it seems, taken for a person employed by Government to examine private property, for the advancement of taxation. I assured them, that my journey rose from the idle whim of an Antiquary; that I had employed myself, and that my right hand must pay my left. twelve yards by five, was designed for the guard. The whole Station is surrounded by a foss. All the entrances are plain. The whole in a high situation. The Wall here is six feet thick. Mr. Bowman’s fold, &c, stand on the very work. I left these worthy people with some concern. There are three principal zones of inscription recovery at Housesteads: the fort itself, the civil settlement, and a religious area around Chapel Hill. Whilst these largely reflect areas of antiquarian interest and archaeological exploration, it has to be said that Chapel Hill does seem to have a prominence that is more than purely topographical. An interesting variety of deities are represented by the altars from Housesteads, many of which come from Chapel Hill, in the civil settlement to the south of the fort. Ever-popular Cocidius is present (1577–8 and 1583), although out-numbered by Mars (1590–7), Mithras (1599–1600), and the Veteres (in all his/her/their forms: 1602–6). 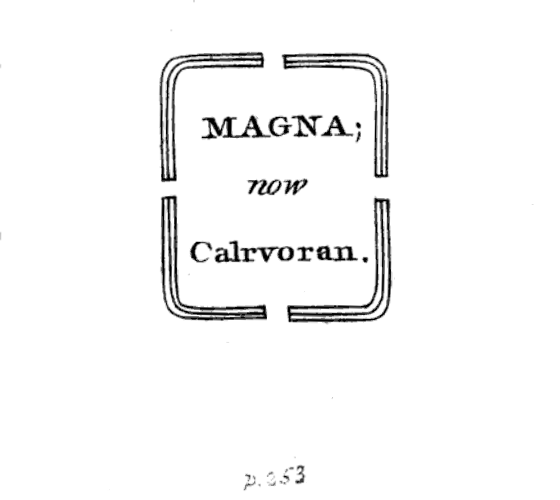 A particularly intriguing dedication (1574) is the one to Clarian Apollo, which chimes with nine other examples from the Empire and may be connected with the Antonine plague of AD 165, brought back to Britain from the East by soldiers returning from the wars there. Inscriptions record the presence of Germans (1620), at least one of them a soldier (1619), accompanied by Germanic deities – Mars Thincsus (1593) and the goddesses Alaisiagae, Baudihilia, and Friagabis (1576 and 1594) – and this relates to the presence of auxiliaries from the thousand-strong* First Cohort of Tungrians (1578–80, 1584–6, 1591, 1598, 1618–19, and 3326), who are still recorded as the garrison unit at Housesteads in the Late-Roman Notitia Dignitatum and had previously been based not far away, at Vindolanda. 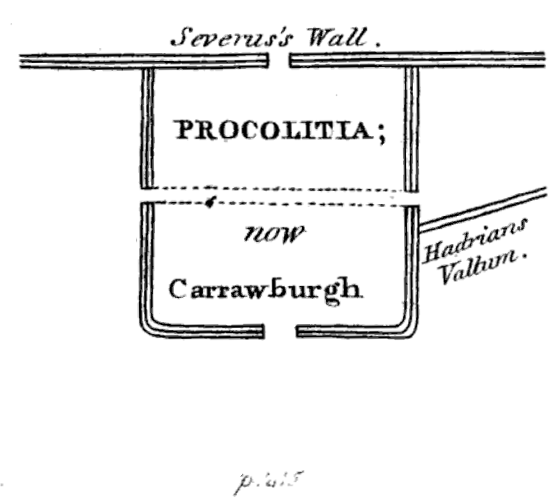 However, whilst the garrison of Hadrian’s Wall is usually depicted as being made up entirely of auxiliary cohortes and alae, one inscription (1583) records the presence of legionaries of II Augusta as ‘agentes in praesidio‘ (‘acting as the garrison’), suggesting that their presence at Housesteads was a stop-gap measure, and that is not the only mention of legionaries. The Second Legion occur again (1582) and the Sixth twice (1577 and 1609). The occasion for this legionary substitution may well have been the removal of auxiliary garrisons from Hadrian’s Wall to the Antonine Wall (the First Cohort of Tungrians turn up at Castlecary and Cramond). Later, irregular units – the cuneus of Frisians (1594) and the numerus of Hnaudifidus (1576) – are based at Housesteads, probably accompanying the Tungrians. * The term milliaria, whilst technically meaning one thousand strong, is a generalisation, for we know such a unit had ten centuries of 80 men. It would thus have been nearer 800 strong, assuming all centuries were up to strength, which is unlikely. Vindolanda Tablet 154 shows that the Tungrians had only 752 men and six centurions when it was written, c. AD 92–7, suggesting that a shortage of centurions was not only a Hadrianic problem. I am now thirty miles from Newcastle. Becoming a gainer at Twice Brewed by a broken promise, which is seldom the case, I retreated next morning over a Moss to my favourite pursuit, which brought me to Housesteads, the grandest Station in the whole line. In some Stations the Antiquary feeds upon shells, but here upon kernels. Here lie the remains of antient splendour in bold characters. The line, as usual, proceeds over the crags, which leave a precipice fifty feet high on the North. At the bottom are three pools. The Wall is six or seven feet high; but miserably broken, and continues in the same style six or seven miles, a heap of rubbish. In some parts only three feet high, and occasionally shews five or six courses of facing-stones. The Station is, of course, much elevated; declines to the South; the ramparts are plain. A very large Suburb seems to have been added to this populous City, now reduced to one solitary house; the whole about fifteen acres. The curious observer, I believe, may count twenty streets. The population, perhaps, could not be less than two or three thousand souls. From the melancholy relicks on the spot, it must have been graced with some elegant buildings. A Temple, no doubt, was one. I saw the square base of a large pillar, with a circular shaft proceeding from it, fourteen inches diameter; curiously moulded. Another, of a different form, with a square shaft eighteen inches diameter; noble remains of fifteen hundred years! which loudly declare the days of antient splendour. The Castle stood at the corner, North-West, within the Station; was itself moated round, as were also the Station and the Suburbs, separately. Joining the Wall, within, are the remains of a court of Justice, about twelve yards long, and six wide. In the West corner was the Judge’s seat, six feet diameter, and quoined with stone, ten courses of which remain. It is not easy to survey these important ruins without a sigh: a place once of the greatest activity, but now a solitary desert; instead of the human voice, is heard nothing but the winds. In the farm house, down in the valley, the jamb which supports the mantle tree is one solid stone, four feet high, two broad, and one thick, compleat as in the day the workman left it, as in the Plate here annexed; which may be also found in Warburton’s History of the Wall, Plate III. 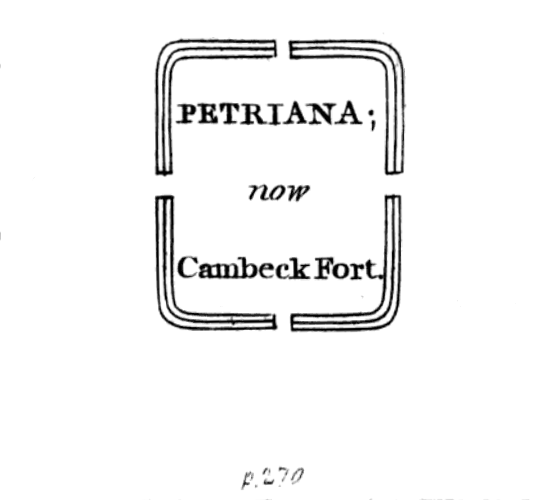 p.60; and in Gough’s improved edition of Camden’s Britannia, vol. III. Plate xvii, p.245. There are also many curious figures, all Roman, in this Station. I had now the severe task of creeping up rocks, and climbing stone walls, not well adapted to a man who has lost the activity of youth. As the works of the two celebrated Chiefs continued in view, and being invited by a single house in the valley, of some magnitude, called Bradley Hall, where I might gain knowledge; I descended the hill, to tread upon that venerable ground; a distance Warburton calls 600 yards, perhaps good measure. I found them all very distinguishable, though in mowing grass, and in a perfect swamp. 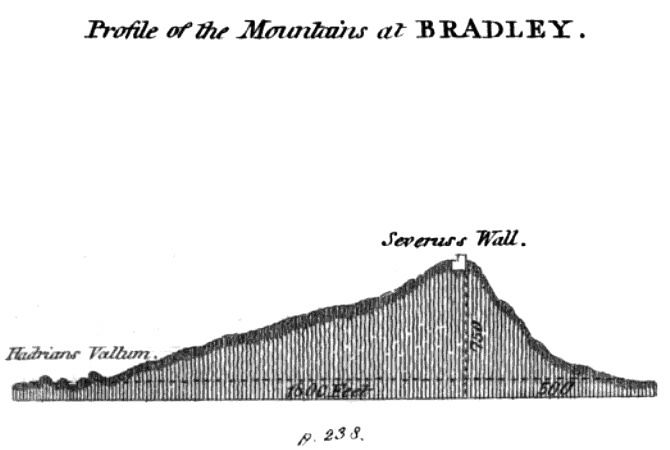 The annexed Plate shews a profile of the Mountains at Bradley Hall, on the top of which runs Severus’s Wall, and Hadrian’s Vallum at the bottom. Entering the Hall, the family, whose name I am sorry I have forgotten, seemed to strive which should treat me with the most kindness. It consisted of a father and mother, two sons, near six feet each, and two beautiful Sacharissa’s, who, though aiding the churn, will not, like Waller’s lovely rose, bloom and wither in a desart [sic], but find their way into the busy world. On the rough rock, opposite Crag Lough, the Wall is three feet high; but deprived of all the facing-stones, and bends to avoid the pool. The ditch is in perfection. At another spot upon this Crag, the Wall is eleven courses high on one side, and from three to five on the other; and, for sixty yards, is eight feet high. I now consider myself in the middle of the kingdom, between the German Ocean, and the Irish Sea; consequently upon the most elevated ground between both, and distant, in a strait line, by land, about fifty miles from each. We must allow, from the convexity of the Globe, a rise of one hundred and fifty yards; and the mountain on which I stand will perhaps give a rise of forty more. It follows, I am elevated one hundred and ninety yards above the Sea. The prospects are not grand, but extensive, and rather awful. Upon the Great Crag, are three courses of facing-stones. The judicious Warburton “believes, that the works of Hadrian lie at a considerable distance South of this Station, and that they make a small turn at the brook to come at it.” But can a thing be brought near to what does not exist? Hadrian was dead long before the appearance of this Station. I think myself bound to place Little Chesters among the Stations, that I may follow my predecessors, and not break their numerical order. Although Roman, and garrisoned by Romans, it does not appear to belong to the works of Severus. It stands near two miles South of the Wall. Agricola erected Castles adjoining his Works; but this stands nearly a mile South of his, therefore it could add no security. no end but that of a prison. As Little Chesters is the first that occurs, it is necessary to speak of the four. Hadrian and Severus could have nothing to do with these. They were most probably the work of Agricola. That he made the banks and ditcbes I have described in his name, is not doubted. That he erected some Castles, is as clear; but, for many ages, all his ramparts, mounds, trenches, and Castles, have gone under the name of Hadrian’s. If he erected Castles and mounds, there must have been roads to communicate with them. It is reasonable then to conclude, that he was the author of all the roads appertaining to his Works. A Roman road went from Walwick Chesters, directly to Little Chesters, and left Carrowburgh and Housesteads much on the right. It then proceeded from Little Chesters to Carvoran, leaving Great Chesters on the right, and directed its course to Cambeck Fort, leaving Burdoswald to the right, and then took its course to Watch Cross. 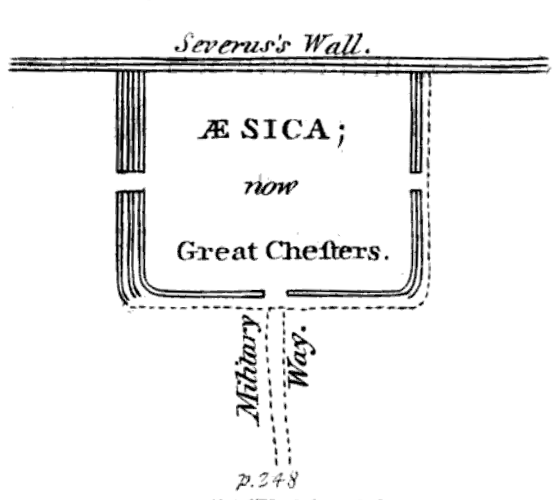 All these four Stations lie to the South, totally distinct from Severus’s Wall, or Stations; Agricola must have formed them for the accommodation of his works. The road I have described is about eighteen miles; besides many smaller roads, which were connected with his grand undertaking. It may be considered as a string, and Severus’s Wall the bow. It ends in the great military way, and joins Severus’s Wall, about four miles before we come to Carlisle, in all about twenty-eight miles. Severus, afterwards, constructed a great number of roads, now to be seen, which branched from this towards the North, and communicated with his Wall, Stations, &c.
The Wall, at Wall-green, takes a small turn, and continues about three feet high, broken as usual; and Severus’s Ditch is in high preservation, as we rise the hill to the next Station. This Station is elevated as usual, and thirty-five miles from Newcastle; is about five acres, very uneven. No buildings remain, except a modern farm house, all the doors of which I found open, and none to guard the premises but a child, from whom I could gain no intelligence. There was no danger of a thief; for, in this solitary place, he must come a great way to take a little. The trenches and ramparts are bold, particularly on the waste, where they are very large. This appearance of the place, and the idea of past transactions, strike the soul with awe. It appears by the ground, that the buildings have swelled into a Suburb. The marks of a Temple, and Court of Justice, are visible. The Wall, in confusion, is here about three feet high. The swelling banks shew where the Castle ftood, and particularly mark the butments. The General and the Emperor, with mild features, are seen half a mile below, gliding along the valley. Drawing near Cockmount Hill, four hundred yards forwards, and in a high situation, I am frequently favoured with a few courses of facing-stones. Agricola and Hadrian, still half a mile South, in the valley; the reason is, Severus attempts a precipice, if he can. Here the Wall ascends the rocks. There is a Tumulus in the meadow, near the works of the two great men. Now we come to a Well, made famous because one of the Saxon Kings was baptized here, perhaps without a feast. We arrive at Walltown, if a single house deserves the name. On each side the door stands a Roman Altar, used for washing hands, kettles, dishes, &c. and has at last the honour of supporting the dish-clout. I saw one old female, who treated me shily, and heard a younger, who durst not see me; and both, I have reason to think, wished me gone: but, perhaps, I had the most reason to be frightened. The Wall ascends the rocks. Here Camden was terrified again, at the imaginary houses of the Moss Troopers, and relinquished his examination of the Wall. The name is Walton Crag. I found the ascent so difficult that I sometimes was obliged to crawl on all fours. Here the Wall having facing-stones on each side, allowed me to take the measure; I found its thickness barely nine feet. In one place, for about two yards, and that upon a sharp declivity, there are eight courses of facing-stones. Rising the hill to Walwick, the village is delightful, and the prospect most charming. At the corner of a garden-wall, I saw a beautiful pedestal, pannelled, moulded, and fluted, in perfection, two feet by eighteen inches; no doubt a Roman relick, degraded to a shabby prop, as a thing of no value. We pass the seat of Henry Tulip, Esq. The works of Agricola and Hadrian still continue on my left; but Severus crosses the turnpike road in the village, and appears on my right, a Wall three feet high, but in a rude state, and without facing-stones; for we can easily conceive a wall, levelled with the ground, and seven or eight feet thick, will bear its own rubbish a yard high. The Emperor and General on my left, in striking characters, are cut through the rock; and, the great military way fills up the space between Severus and them. I am now at the twenty-third-mile stone; the morning delightful, and the parallel lines before me magnificent. At the twenty-fourth-mile stone, I still have Severus’s trench, and what remains of the Wall, on my right, and Hadrian’s works on my left, with the military way on which I tread, only twelve yards wide, between, which fills up the space. Thus am I hemmed in by dignity, upon the best of roads, upon elevated ground, with extensive prospects, in a country thinly inhabited, surrounded with commons, or with inclosures of fifty or a hundred acres each, but without trees or hedges, and where the face of the earth seems shaved to the quick. Yet in this solitary place, where foot seldom treads, I enjoy the company of three valuable friends, Agricola, Hadrian, and Severus. At Towertay, Severus’s Wall appears in more dignity, with two or three courses of facing-stones; but generally, in this part of my rout, with only the rude stones lying upon the foundation. This seventh City upon the Wall lies upon an open and elevated spot. A farm-house stands exactly upon the works of Hadrian and Agricola. The Station joins the house, is six or seven acres, in grass, exceedingly hilly, declaring the former actions of busy life, and is yet secured by its original ramparts. The Wall here makes a bend, as if with design, to inclose this spot. It seems, by the roughness of the ground, to have had a suburb to the west, where a well, or rather a Roman Bath, has been found seven feet square, quoined with stone. I was treated here with great civility when they found I was neither Exciseman, Spy, nor Methodist Preacher. A Roman stone, which graced the old Castle, graces the internal wall of the present house; a man’s chubby face, ten inches square, without inscription, but is ornamented with drapery. Here the bold ruins of all the works appear. At the twenty-fifth mile stone, Hadrian is forty yards on my left, and Severus close to my right, not very conspicuous. Upon the hill rising to Carrow, the foundation of Severus’s Wall is fresh, with a boundary hedge growing upon it; and in one place three or four courses of facing-stones appear for about fifteen, yards. The other two thirty yards on my left. Pass by Carrow, a single house, on the summit of an eminence, where must have been a Mile castle; it lies between Hadrian and Severus’s works. At the twenty-sixth mile stone, the General and the Emperor are seen in formidable beauty; while Severus is rather sinking, yet noble. Upon the hill, twenty-six miles and a half, all the mounds and trenches appear in strong lines. At the twenty-seventh mile stone, the two appear in bold and noble characters. But now I must quit this beautiful road, and the more beautiful scenes of cultivation, and enter upon the rude of Nature, and the wreck of Antiquity; for this grand military way bears to the left, and the Wall to the right. I am now thirty miles and a half from the Wall’s end, and twenty-seven from Newcastle; have been, close to the Wall all the way, except at passing the Tyne; and, for about twenty miles of the above space, have trod upon the very Wall,, as constituting part of the great military way, though unobserved by the common passenger, with Severus’s trench at my right elbow, generally in a bold style. The works of Agricola and Hadrian mostly visible on my left; but always carried through inclosures. The two works now must separate, and be a mile, or near it, asunder for the next ten miles; for Agricola and Hadrian humbly pursue the lower grounds, while Severus climbs the rocky mountains. I follow the Wall, it now appears six feet high; but divested of facing-stones and in a rude heap. 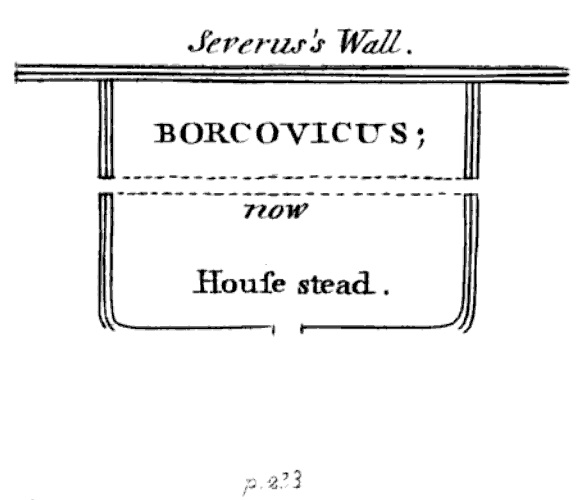 Here I find the platform of a Castle, whose wall is six courses high, and about four feet long. Travelling three hundred yards, I come to the foundation of another building joining the Wall; but levelled, in the form of a bow, the Wall supposed the string. It could not be a Mile castle; perhaps a place of arms. Half a mile before I come to Shewenshields are the remains of a Castle, twenty-two yards by thirty; an entrance on the East, South, and West with a foss on three sides, remarkably bold, and on the fourth the Wall. It has had four Turrets one at each corner. Here I observe Agricola and Hadrian creeping modestly along the valley below. Severus runs along, from one to three feet high, all confusion, mounting every craggy precipice it can find, and, from the prodigious declivity on the North, needs no ditch; while Agricola and Hadrian beautifully proceed over a small eminence below, five hundred yards South, where their works, or rather Agricola’s joins a large fort sixty yards square, once a Castle. Here Severus’s Wall runs crooked, and catches the precipices wherever it can. About a mile after we quit the great road, we arrive at a gap in the mountain, an inlet to the famous Moss Troopers; who here broke through the Wall in bodies, for plunder and blood. The Mosses are the meadows on the North below; which, though rather in an uncultivated slate, are passable. A small Castle stood in the meadow, near the foot of the hill, to prevent the Picts, and afterwards the Moss Troopers, by guarding the pass, the remains of which appear. Tradition says, it was built by King Ethel which must be an abridgment of Ethelrick, Ethelfrid, or Ethelred, for they were all Saxon. Kings of Northumberland. It was not likely to be the first or last, for they reigned but four years each. It must then have been Ethelfrid, who reigned twenty-three years, was a spirited prince, and fought with the North Britons. We may date the erection of this Castle between the year 593 and 617. But, whoever was the architect, he knew but little of Castle-building. It ought to have been placed upon one of the limbs of the pass. I am now upon a place called Shewenshields, about twenty-eight miles from Newcastle, once a Mile castle, now a dreary farm of 2070 acres, occupied by Mr. Matthew Magnay, who paid me every attention. It includes the Mosses on the North of the Wall, and the rocks on the South, and is better adapted to the teeth than the plough. Mr. Magnay took me to a small gutter in the rock upon his farm, which bears the name Cats Cover (as small as would admit a cat). Here the Scots bored under the Wall so as to admit the body of a man; for, if one could get through, a thousand might follow; for there was nobody either to watch, or oppose them. The Britons must have been very supine; for two days labour of three men would have made this narrow pass so secure, that the more they bored, the deeper they would have penetrated into the rocky mountain. The elevation, of Shewenshields house is remarkable; it commands an amazing view, part of which is the Chiviot Hills. Mr. Magnay asked me, “if I would sit in King Ethel’s chair?” to which I assented. He took me to the top of a precipice fifty feet high, close behind the Wall; from the bottom of which rose a perpendicular rock, rather in the form of a chimney, much higher than we stood, and six feet from the precipice; it had a set-off, which resembled the seat and back of a chair; but neither Ethel, nor any one else ever sat in it. The Wall is here six or seven feet high, but in confusion; keeps a zig-zag line merely to follow the precipice. I requested my friend Magnay to conduct me to the famous Busy Gap, about twenty-nine miles from Newcastle; so called from the frequency of the Picts and Scots breaking through this gap, and surprizing the Romans and Britons, and afterwards of the Moss Troopers. This I also found to be a break in the mountain over which the Wall ran, now filled up by a common-field gate, two yards and a half wide. It lies one mile beyond Shewenshields. The simple truth is, they had no rocks or holes to burrow in, or bogs to pass, which another could not. No doubt they Were able-bodied men, as all thieves ought to be, or they would not be fit for their calling. Their manner was, to assemble in a body, break the Wall in the weakest, or most convenient place, fight, run, burn your house, or drive away your cattle, as occasion offered. The advantage would always lie on the strong side. A more dreary country than this in which I now am, can scarcely be conceived. I do not wonder it shocked Camden. The country itself would frighten him, without the Troopers. As the evening was approaching, and nature called loudly for support and rest, neither of which could be found among- the rocks; I was obliged to retreat into the military road, to the only public house, at three miles distance, known by no other name than that of Twice Brewed. A pudding was then turned out, about as big as a peck measure; and a piece of beef out of the copper, perhaps equal to half a calf. “I cannot, except you will sleep with this man” (pointing to a poor sick traveller who had fallen ill upon the road). Having compleated our bargain, and supped, fifteen earners approached, each with a one-horse cart, and sat down to the pudding and beef, which I soon perceived were not too large. I was the only one admitted; and watched them with attention, being highly diverted. Every piece went down as if there was no barricade in the throat. One of those pieces was more than I have seen eaten at a meal by a moderate person. They convinced me that eating was the “chief end of man.” The tankard too, like a bowl lading water out of the well, was often emptied, often filled. My landlady, however, swerved from her agreement; for me found me a whole bed to my wish.